As a wine country Realtor from a wine industry family I love everything having to do with wine country. The Napa Valley is made up of several regions and diverse communities. A destination for world wide wine lovers, the area offers an array of activities and musts whether you are a local, a visitor or are considering a move. Enjoy the enchanting wine country lifestyle. Here are a few exciting activities for you to try. For an out of the ordinary experience in Napa Valley visit Tamber Bey Winery located at Sundance Ranch, a working equestrian facility where winery owners, Barry and Jennifer Waitte, train their endurance race horses. The ranch’s 22-acre property is picturesque with unbelievable views of the Palisade Mountains and Mount St. Helena, and their winemaking facility. Barry Waitte will lead you through a private tour of this spectacular and unique facility. The tour begins with an inside look at the on-site winemaking process in their 15,000 square foot facility with 36 fermentation tanks. Meet the ranch’s beautiful horses in and around the stables. Experience and explore your own custom, six wine flight by choosing any Tamber Bey wine or vintage from Barry’s private library. He will guide you through a historic journey and tasting of Tamber Bey wines. Book through Wine Country Experiences. TIP: Wear comfy shoes as you will be walking through the Tamber Bey property. TIP: Bring your own folding chairs and picnic table or blanket and settle in. 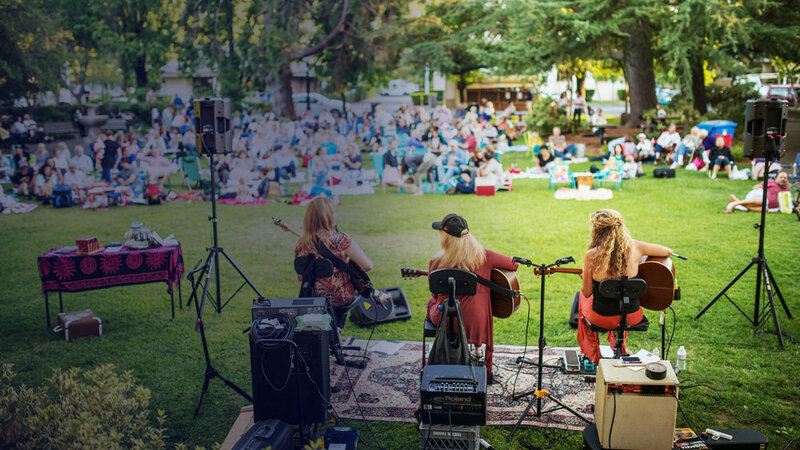 This FREE FESTIVAL brings dozens of local bands to play music and perform on the porches of over 65 beautiful old homes in the historic neighborhoods of downtown Napa. Visitors are encouraged to walk or bike to experience. Grab a bite to eat at food trucks located on Seminary Street in Fuller Park. Facilities at Fuller Park and at the United Methodist Church. Public Parking at the 5th St. Garage. Dogs allowed, leashed, picked-up after and NOT in neighbors yards. NO ALCOHOL event. For a MAP of the event CLICK HERE or get yours the day of the event from the volunteers in Orange shirts. Tip: Bike to the event or take public transpo, wear appropriate sun gear and comfy footwear and bring your own seating to best enjoy the fest.